The March 31, 2012 story makes this edible plant sound like a wanted suspect. “DNR plant specialists say people should especially keep an eye out for garlic mustard, a plant that smells like garlic and has four small white petals. The plant can completely take over entire forest floors, displacing trilliums and other wildflowers.” So, the obvious solution to this is for all of us to get out there are start gathering! Garlic mustard greens are very nutritious as they have substantial amounts of vitamins A, C, E and some of the B vitamins. In addition this wild weed contains potassium, calcium, magnesium, selenium, copper, iron and manganese as well as omega-3 fatty acids. Alliaria petiolata (garlic mustard) has European ‘roots’ and was inevitably introduced to the U.S. by early settlers. It was used as a vegetable for its high vitamin A and C content. This garlic-flavored plant was widely used in cooking, and was also used to prevent erosion. This versatile wild edible was once used for medicinal purposes, treating gangrene and ulcers. The flowers (will not appear until late May depending where you live), leaves, roots and seeds (these appear in autumn) are all edible. Leaves in any season can be eaten but once the weather gets hot, the leaves will taste bitter. Flowers can be chopped and tossed into salads. The roots can be collected in early spring and again in late fall, when no flower stalks are present. First year growth and new spring leaves are basal and have a somewhat scalloped edge. Once the stalk grows, the leaves tend to become smaller, triangular in shape and you know for sure it is garlic mustard when you detect the scent of garlic when crushing a leaf. Be sure to check out the Garlic Mustard pesto recipe! So let’s end off by taking that DNR quote and make it sound positive! Be sure to keep an eye out for garlic mustard, full of vitamin A and C and other nutrients. It smells like garlic and can turn your culinary delights into nutritious culinary experiences! Be warned though – your health will thank-you! Karen Stephenson is an author, professional writer, wild food educator, and a certified Master Naturalist. Foraging and being outdoors are her passions. We’ve got lots of this in our yard in Lincoln, MA. Trying to pull it as I know it’s an invasive. But I find it pretty tasty and have been sprinkling it as a parsley substitute on fish, and adding it to salads. A nice herb in small quantities! Love the article. I recently learned about garlic mustard after both watching some videos from Garry Tibbo and then meeting with Wildman Steve Brill on a nature walk in CT. I was so happy to learn that this ‘weed’ is really food! We have it all over the yard in New Milford, CT and I know that it hasn’t been sprayed with any chemicals. I have been picking it every day, and I usually eat some of it raw, right when I pick it. It is delicious and I love it. Now I also notice Garlic Mustard everywhere I go. It’s like it was invisible to me all this time, but I am so glad to finally have an awareness of it. 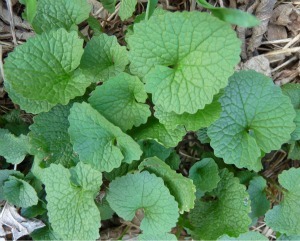 Here in Leicester, UK, I’ve plenty of Garlic Mustard and have eaten the leaves for years. Found this site while searching to see if the roots are edible–which they are! They taste not unlike Horseradish root raw, but not as pungent. Be interesting to see if the strong flavour disappears on cooking, as it does with Horseradish. Glad you liked it Sarah! Thanks for this; It’s March 30, 2015, here in Milan, Illinois, and I just found the newest gm sprouts in my savanna; my neighbor completely ignores his woods while he hires a weed & feed co. to treat his huge manicured lawn as his gm freely seeds my prairie & savanna with garlic mustard. grrrrrr. I have always considered that we’d try some gm sprouts sometime before we send the pounds of gm to the fires of hell. But I knew, too, that I should look into how they’re best used. Your site & comments have been really helpful! P.S. same neighbor laments how his acreage has been consistently eroding for years now – 10 feet of property lost in the last 30 years. He thinks native plants are for hippies. I don’t know as I always air dry. Let us know how they taste once out of the dehydrator! Yummy. Why, on the University outreach service, is there no mention of this being edible I wonder? This is free food that is categorically listed as invasive in so many areas so people should be encouraged/taught to use this nutritious plant! I just made the garlic mustard in a similar way to sauteed asparagus. It was good. Just cut off the stems above the woody part (like asparagus). It does take less time due to the thinness of the stems. Garlic Mustard is an evasive plant and with that in mind there are always considerations when harvesting it. If care is not taken when harvesting, you can spread the plant further by helping to distribute its seeds or propagating it when disposing of unused portions. It certainly does have value as a food, but it will displace native fauna if given half a chance. This may be why University or Governmental Agricultural Departments don’t encourage it’s use as Forage. Yes it is invasive however when foraged all parts are edible including the flowers/seeds – so eat it all! There is a very interesting book that is worth reading… The New Wild by Fred Pearce; well worth reading! Based on what I was taught by a medical herbalist nutrition is maintained! I agree, but the question is why don’t Universities advocate eating it. Their concern would lean more towards control of the plant rather than using it as a food source. I do eat it. In the Spring it is very good added to cream cheese and used as a spread. I also dehydrate it and grind it into a powder and use it as a spice. Even with that, improper handling can and will propagate the plant. Picking the plant when the seeds are ready to burst will spread them everywhere you carry them. If you are going to harvest at that time, put the seed pods end of the plant directly into a bag that will catch the seeds. Overall, Universities and Government Agricultural agencies would rather it be left alone and is why in many states, it is illegal to pick any plant on state land, evasive non native or otherwise. Those same agencies do sponsor Garlic Mustard removal activities by groups that have been trained to remove it properly. Any idea of the oxalate content of garlic mustard? Oxalate is in most foods we eat. Although I do not have anything specific to garlic mustard it is categorically a mustard green and possibly the content is moderate. Check out this link… Oxalate Content of Food. Nice article encouraging the use of garlic mustard. Don’t downplay the invasive nature of GM just because it is edible. It truly is an aggressive plant that has a big unnatural footprint in a lot of places. Hi! Do you know where I could find the specific nutrient content of this and other wild foods in my area? I’m interested in quantified values for the micronutrients, as well as any other info that may be of use. For instance, I have heard that garlic mustard is higher in cyanide than other mustards, and should not be eaten more than a couple times per week for this reason. In addition to being a fan of delicious wild foods, I am also a nutrition student, and would find this information useful. Thanks for any help! Hi – I get all my research from a huge number of universities worldwide. There is no one central area to get nutritional information. It’s taken me years to get nutritional info on wild plants. I heard the seeds could be used to make mustard. Do you know if that is true? I love spicy mustard. I read that to remove the cyanide it is best to soak the leaves. Would love to know for how long. Help! It’s taking over my yard. And I can’t eat it. There is way too much lead in the soil. Chris – to get rid of lead, try growing sunflowers, they are used to pull up radioactive materials or other heavy metals. Also when eating pineapple, it’s fiber pills lead out of your system, also apple fiber does as well, as well as maybe coconut charcoal, bentonite clay, there’s internal and external use, so make sure you eat the correct type. Karen Stephenson, thanks for talking about garlic mustard. If left alone, it can take over acres, I talked to a co-worker that helped spray a state park that said it was a couple acres solid. I eat it, it tastes good. I’ve done herbs and foraging for eighteen years, this is the fastest, worse spreading invasive that I know of, so far. It has to be kept in check so it doesn’t get to the point like Oriental bush honeysuckle is now. If nothing else, bring a big plant inside for a free houseplant. Get your nutrition from nature. See our newsletter for recent edible plants and recipes. All photography, unless otherwise stated was taken by Karen Stephenson. All photographs are Copyright © EdibleWildFood.com 2011.